Home » Blog » What Kind of Worrier Are You? 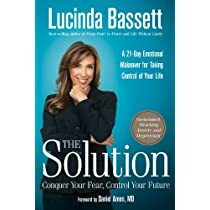 In her new book, The Solution: Conquer Your Fear, Control Your Future, bestselling author and motivational speaker Lucinda Bassett lists 13 types of worriers. I found the categories rather interesting because — I’m not sure whether or not you’ve picked up on this — but I’m a huge worrier. And this list actually made me feel better because, while I checked off the majority of them, I realized I still have plenty of things to worry about that I hadn’t even thought of! Score! You have low self-esteem and are overly sensitive to criticism. You’re a people-pleaser, craving reassurance from others rather than yourself. You worry about not being good enough and not being able to trust other people. You feel needy and clingy in your relationships. You worry about being abandoned by your partner. You are devoted and loyal and you do whatever it takes to keep the connection going. You worry about confrontation and speaking your truth directly to another person. You resist meeting the wishes and needs of your spouse, boss, or friends by procrastinating, feigning forgetfulness, or being stubborn, inefficient, and indifferent. You worry about work and productivity. You keep lists and tight schedules, and you have high standards for yourself and your coworkers. You are reliable, honest, and overly devoted to work. On the surface you appear worry-free. You are charming and fun to be with. You thrive on excitement, adventure, and taking risks. You sometimes break the rules to get what you want, maybe hurting other people in the process, which comes at a price–a nagging feeling in the pit of your stomach that your impulsiveness will finally catch up with you and get you into trouble. You feel superior to others and believe you deserve special attention and admiration. You worry about maintaining an appearance of perfection in your status and position in the world. You worry that others will see chinks in your armor and cracks in your perfect veneer. You are exciting and glamorous. Everyone is attracted to you and seduced by your charismatic personality. You are emotional and theatrical: you enjoy attracting attention to yourself in imaginative ways. You worry about holding other people’s attention and you constantly attract drama into your life to keep people interested. You are consumed by intense, ongoing worry, characterized by episodes of anxiety and panic. You are high-strung, irritable, and edgy, always waiting for the crisis to occur. You have anxious energy and you need to keep active to distract yourself from worrying. Your worry is focused on feelings of doom, hopelessness, aloneness, isolation, and sadness. You feel misunderstood; your worry causes you great concern, emotional pain, and suffering to the point that normal functioning is difficult. You worry is focused on your health. You go from one real or imagined health concern to another, certain you are at risk for major illness or disease. You are consumed with thoughts of death and dying, or fear of some looming, undiagnosed, horrible disease. Your worry is overblown and all-encompassing. You suffer from “the sky is falling” syndrome, certain the worst-case scenario will happen and that the world is coming to an end. Your life seems impossible to manage, there is no solution, and you know it will destroy you and everything around you. You worry that things are out of your control. You believe there is no answer, you have no power, someone is out to get you, and no one cares or understands. You don’t trust people; you feel victimized, taken advantage of, cheated, and abused. You worry is occupational, a full-time job, as you constantly worry about everything. You attach worry to every thought and you can’t get away from it. You overanalyze, scrutinize, and dissect every possible scenario, repeating the various outcomes in your head.